एउटा अनुत्तरदायी जड्याहाको चरम लापर्बाहीले गर्दा कर्मबिर शिबको सग्लो जिन्दगी एकै क्षणमा तहस नहस भयो।तर शिब जिबित छन्,यिनी आफ्नै खुट्टाले ठमठम नहिडिन्जेल र आफ्नै पौरखमा बाँच्न नसकुन्जेल “ दुखमा समाज र साथी” को उद्घोष सहित यो सहयोग संकलनको अभियान शुरु गरिएको छ।अरुको अप्ठेरोमा सद्भाब सहित सघाउने तपाई पृयजनहरुलाई हामी कसरी धन्यबाद दिउँ? कस्लाई के थाहा ! भोलि यो ब्यथाको पात्र तपाई हामी आफैँ पनि हुन सक्छौं ! 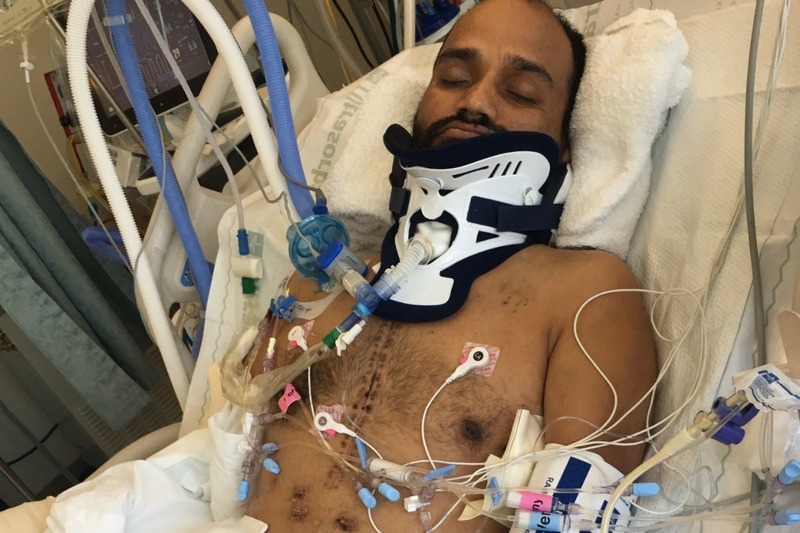 Shiva Khanal, our brother/son/friend, with his permanent residency in Tanahun, Nepal and now living and in Sunnyvale, California has survived a serious accident about four months ago and fought a battle for his life, remaining unconscious for 35 days in hospital. Thanks to the tireless effort of Doctors, health workers and advanced medical science, he has been discharged from the hospital after three and half months. But he requires a wheelchair support and has to visit hospital regularly for his therapy and treatment. He is in the very long road to recovery and will not able to work for a foreseeable future. For those last three months we were praying for Shiva’s life and few of friends were also working with the insurance company for the best compensation he can get, and is still working on it. But we have been shocked to hear that the other person driving vehicle that caused accident didn't have strong insurance and he seems to be staying in US illegally. Still, Shiva’s attorney is working to get the best possible benefits for him. Now it is getting hard for Shiva to live and continue his treatment in this expensive city. Medi-Cal denying to pay for many medications. Realizing this as not only his personal problem but also a problem of our community,So we have decided to start this campaign to help him. Our small support can collectively be a very huge help for Shiva to smile and live in this beautiful world. So we request to all the helping hands and kind hearted people to raise the hand of support and ease the financial pressure for Shiva in this hard moment of his life.